Originally intended for construction subsequent to completion of the first construction phase of FRA’s new Terminal 3, Fraport AG, the owner and operator of Frankfurt Airport (FRA), has received the required permit from the building inspectorate of the city of Frankfurt for the construction of Pier G.
The move has been brought about by increased passenger growth, with the airport handling 58 million passengers last year. The building of Pier G should be completed by summer 2021. When completed, it is anticipated that Terminal 3 will be able to cater for an additional 25 million passengers a year. According to Fraport, the new pier will be built as a fully functional, state-of-the-art passenger handling facility and later integrated into FRA’s new premium Terminal 3. Pier G will excel with lean processes that enable passengers to get to their flights quickly and easily by the shortest possible paths. It is understood that the contract for the construction of Pier G will be awarded early next year. The state of Hesse owns about 30 percent of Fraport and the city of Frankfurt holds 20 percent. Regional aircraft lessor Nordic Aviation Capital (NAC) has delivered two Embraer E195s, MSNs 19000669 and 19000240, to LOT Polish Airlines on lease. NAC is a leading regional aircraft lessor serving over 70 airline customers in 48 countries. The company provides aircraft to well-established carriers such as British Airways, Air Canada, LOT, Azul, Lufthansa, Garuda, Flybe, Aeroméxico and airBaltic as well as major regional carriers including Air Nostrum and Widerøe. NAC’s current fleet of over 450 aircraft includes E170, E175, E190, E195, ATR 42, ATR 72, Bombardier Dash 8, CRJ900, CRJ1000 and CS300. In addition, the group has circa 50 aircraft on firm order. MRO service provider SR Technics has signed a major engine maintenance, repair and overhaul agreement with Eurowings, the Lufthansa Group’s low-cost airline. The two-year agreement was signed at the end of June 2018 and covers part of the airline’s CFM56-5B fleet. Cooperation with Eurowings began in January of this year and in order to meet the demands of the carrier’s large engine shop visit demands, SR Technics provided single engine shop visit offers to customize its services. This, combined with slots that met the carrier’s planning needs and SR Technics’ continuous support, was key to clinching the two-year contract. All work under the new agreement will be completed at SR Technics Zurich Airport facility and covers engine maintenance, repair and overhaul solutions, including airfoils repairs in SR Technics’ Cork, Ireland facility, and the full parts and material management for more than 30 engines. 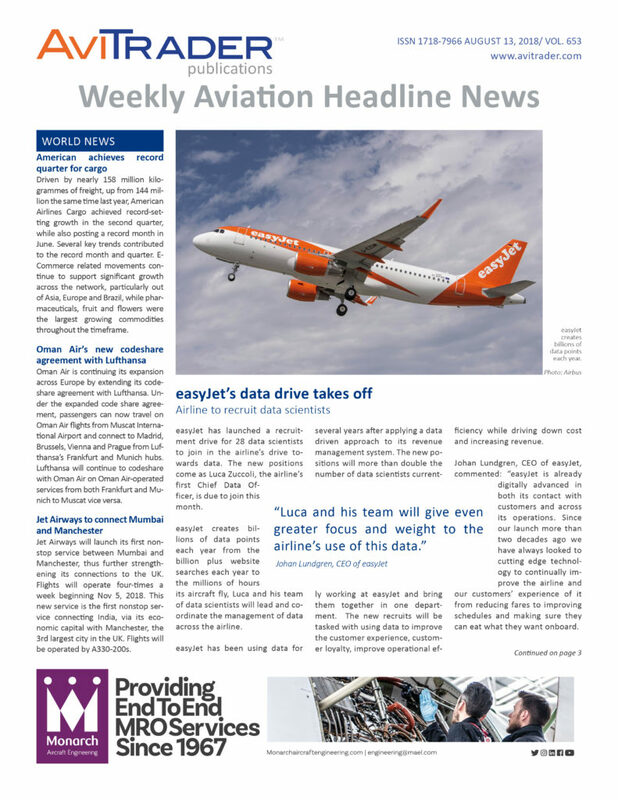 As Eurowings is a major player among Europe’s low-cost carriers, there is plenty of room for synergies with other areas of SR Technics moving forward. Delta Air Lines has entered into a codeshare partnership with Kenya Airways on flights to and from Kenya Airways' hub at Nairobi's Jomo Kenyatta International Airport. Effective Aug. 11, Delta's code will be placed on Kenya Airways' flights from Amsterdam, Paris, London, and Accra to Nairobi, enhancing connectivity and providing customers with a one-stop seamless travel experience from the United States. In addition, Delta will place its code on Kenya Airways' services to more than 10 key cities across Africa, including: Addis Ababa, Ethiopia; Lilongwe, Malawi; Maputo, Mozambique; Johannesburg, South Africa and Djibouti City, Djibouti. Delta and Kenya Airways are both members of the SkyTeam alliance. Israel Aerospace Industries, Israel's national defense and Aerospace company, has issued its consolidated financial statements for the quarter ended June 30, 2018. In the second quarter of 2018, the Company reported sales totaling US$895 million, representing an increase of 4.2% in sales compared to the corresponding quarter of last year, as well as net income of US$10 million and operating income of US$30 million. The Company has cash balances in an aggregate of US$1.6 billion and positive cash flows from operating activities totaling US$104 million. Yossi Weiss, the outgoing CEO of IAI: "IAI concludes the second quarter of 2018 with the largest order backlog in its history, currently reaching almost USD 13 billion, also reflected in an increase in sales in the quarter, which is expected to continue into the next quarters. Concurrently, the growth trend in the various markets in which IAI operates is pursued, with emphasis on North America, Europe and Southeast Asia, and we continue offering our customers the most advanced tailored solutions for the constantly changing map of threats. FLYdocs, the aviation data and records management software provider and a leader in managing the lease transfer of aircraft and assets has appointed André Fischer as CEO. Fisher joins from AAR Corp, where he has held the position of VP Business Strategy for the past 2 years. He brings a wealth of experience from the aviation sector, with his career spanning over 20 years, including management roles at Rolls-Royce, Fairchild Dornier and Lufthansa Technik, which he joined 2002 and has held series of senior sales and marketing positions. The first ACJ320neo has been assembled on programme, fitted with CFM International LEAP-1A engines and painted in ACJ house-colours, in preparation for a first flight in the coming weeks. After delivery to Acropolis Aviation of the UK in the last quarter of this year, the aircraft will enter outfitting at AMAC in Basle, Switzerland, where an Alberto Pinto-designed cabin will be installed, and be repainted in the customer’s colours. Like the airliner versions from which it is derived, the ACJ320neo Family features new-generation engines and Sharklets, saving around 15% in fuel and delivering a leap forward in inter-continental range. Orders for the ACJ320neo Family stand at nine aircraft, comprising three ACJ319neo and six ACJ320neo aircraft. Two major Asian airlines entrusted Lufthansa Technik with the technical support for the HGT1700 auxiliary power units (APU) of their A350-900 fleets. South Korean carrier Asiana Airlines signed a ten year long-term contract for the HGT1700 APUs of its planned fleet of 30 A350-900 aircraft. The services will be provided in the frame of an exclusive time and material agreement and will start in August 2018. All repairs will be performed in the workshops at Lufthansa Technik's headquarters in Hamburg, Germany. Vietnam Airlines also entrusted the maintenance of its HGT1700 APUs to Lufthansa Technik and signed an exclusive time and material contract. The national carrier of Vietnam will operate a fleet of 14 A350-900s. Lufthansa Technik is the official warranty station and partner of original equipment manufacturer Honeywell for the maintenance, repair and overhaul of the HGT1700 APU. The German company has a vast experience in APU overhauls and value-adding engineering services. Lufthansa Technik is also continuously collaborating first-hand with the manufacturers in the improvement of repair processes and related technologies. 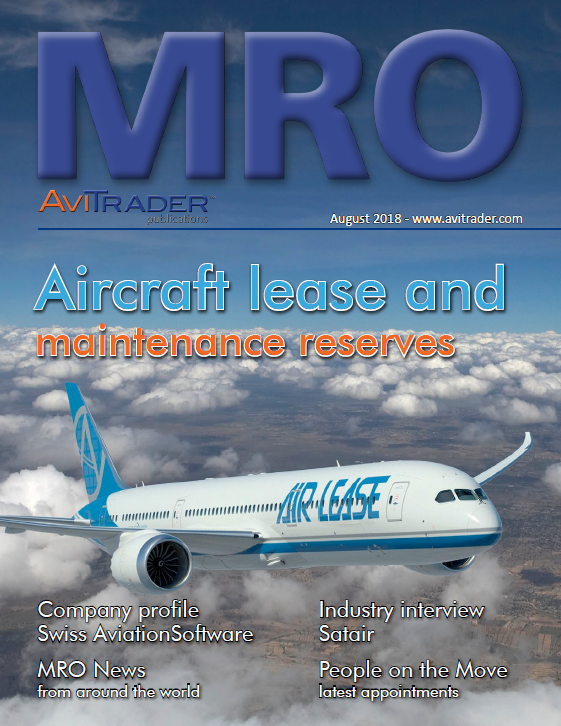 AviaAM Leasing, a global aviation holding company engaged in commercial aircraft acquisition, leasing and sales, has sold two Airbus A321-211 aircraft with lease attached. Both aircraft are being operated by Montreal based Canadian low-cost leisure airline Air Transat. The two aircraft were delivered to the new lessor on the 14th of August, 2018. The two A321’s are currently under a 10 year operating lease agreement that has been successfully transferred to the new owner. The aircraft, that are powered by two CFM56 engines, were previously delivered ahead of schedule to Air Transat in Kaunas International Airport, Lithuania. Bombardier MRO has announced that Joe McDonald has joined the company as Regional Vice-President, Sales for the Americas region. In this key leadership role, McDonald is responsible for developing strategic plans to promote sales growth and ensure excellence in customer satisfaction for the Bombardier Aerostructures and Engineering Services’ component repair business in the region. He will also specifically support the continuing growth and expansion of Bombardier’s Dallas-based MRO facility. Furthermore Martin Williamson has been appointed as Head of Sales and Marketing for Europe, Middle East, Africa, Russia and Asia. In his new role, Williamson continues to be part of the Customer Services leadership team and is responsible for the development and implementation of sales strategies for these regions. In addition, he will develop a growth strategy for Asia, which will identify opportunities for partnerships and collaboration agreements with other companies and airlines in the region.